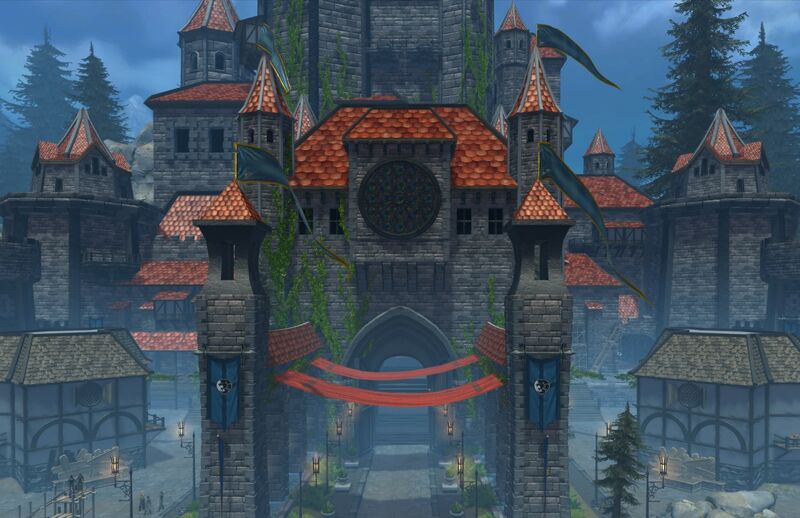 In the forthcoming Shroud of Souls module, we are excited to debut a new feature for Strongholds: the Guild Great Hall. The Great Hall is the building at the heart of your stronghold, and the aim is to give guilds a space they can customize and decorate as they choose. Up until now, the doors to the Great Hall have been firmly closed. With this new module, those doors are thrown open and you and your guild mates can go inside and start decorating! Inside the Great Hall you will find four large tables surrounded by chairs, an imposing fireplace, and two flights of stairs leading to a gallery above. To the right of the main doors as you enter you’ll find a new contact, the Decorator, who can guide you through some of the things you need to know. 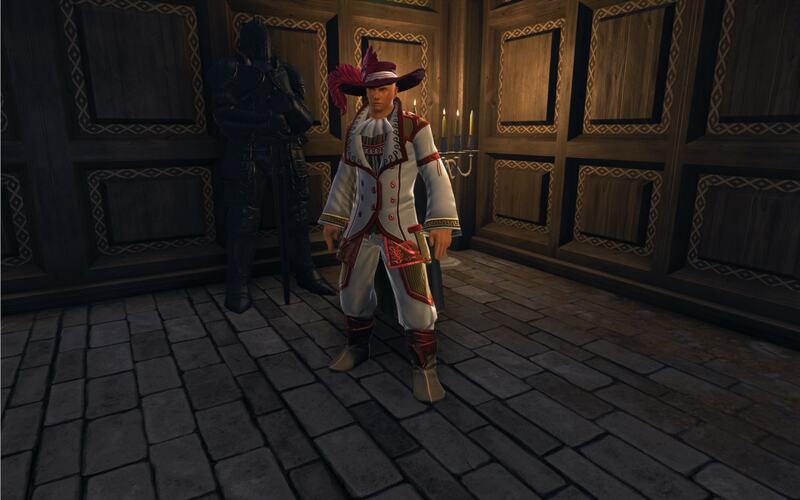 The Decorator is also the contact you need to talk to in order to donate furniture and decorations to your guild. These items are stored in your guild’s warehouse (which works a little like the guild’s main coffer). 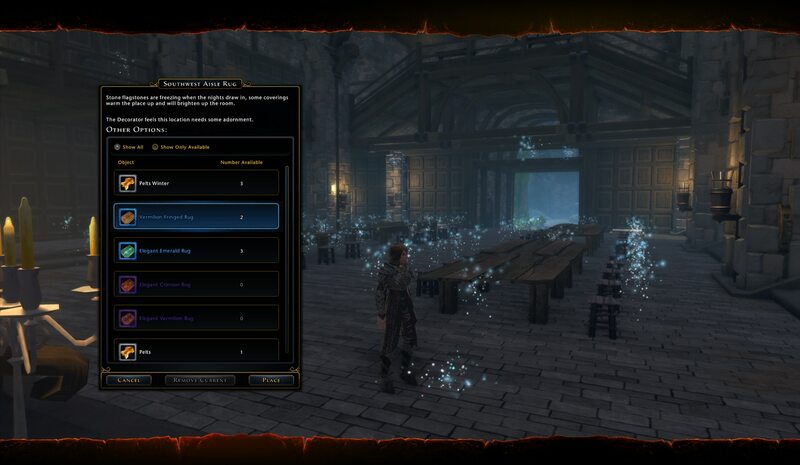 Decoration items and furniture can be acquired from stores and events in Neverwinter, but primarily they need to be crafted by skilled players. The majority of the items you can put in the guild’s warehouse come from Masterwork Professions, including tables, chairs, rugs, statues, and more. Once you have some items in your warehouse you can tell the Decorator you want to start decorating, which causes each of the locations you can decorate to sparkle. Interacting at any of these spots opens a window of available furniture or decoration items for you to choose from. Select the item you want to place and it appears at that location. If you remove or replace an item, it is returned to your guild’s warehouse. When you’re done decorating, go back and tell the Decorator and the locations return to normal. There are over 90 locations in the Great Hall you can decorate and several pieces of furniture or decorations for each type of location. In forthcoming releases we’ll continue to expand the selection and introduce new and unusual decorations. If you want to see more about the items you can place in your Great Hall, take a look at this article by Jeff Miller, which talks about the art of the Great Hall in some more detail.